Difference between revisions of "Van Wert County"
On February 12, 1820, the Ohio government authorized the creation of Van Wert County. Residents named the county in honor of Isaac Van Wert, a hero of the American Revolution. Van Wert helped capture Benedict Arnold, the most notorious traitor in American history. Van Wert County was originally part of territory set aside for Ohio’s Native Americans by the Treaty of Greeneville. Van Wert County is located in the northwestern part of Ohio. Its western border helps form the boundary between Ohio and Indiana. 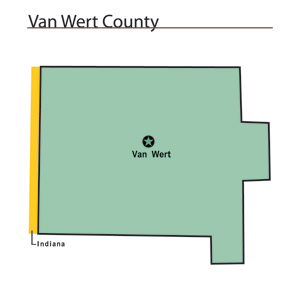 The county seat is Van Wert, which is the largest community in the county with a population of 10,690 people in 2000. Just over one percent of the county’s 410 square miles are deemed to be urban. The county averages seventy-two people living in each square mile. Between 1990 and 2000, the county experienced a 2.6 percent decrease in population. This is typical of Ohio’s more rural counties, as residents seek better opportunities in the state’s larger cities. In 2000, the county’s residents numbered 29,659 people. Most of Van Wert County’s residents find employment in agricultural positions, with ninety percent of the county’s acreage under cultivation. The county ranks ninth in the state in soybean production. Manufacturing, retail, and service positions finish second, third, and fourth respectively. In 1999, the county’s per capita income was 22,916 dollars, with 6.4 percent of the county’s residents living below the poverty level. Most voters in Van Wert County claim to be independents, yet in recent years, they have overwhelmingly supported Republican Party candidates at the national level. Van Wert is home to the Brumback Library. Founded in 1890, the Brumback Library is the first county wide public library to exist in the United States.